...for rooms that at times are both formal and casual, decorative and simple, tough and elegant. For some buyers, for particular areas of a home or business, tile is often the hands-down favorite flooring choice. It can be formal or casual, dressed up or down, dazzlingly decorative or stunningly simple. Recently a group of designers from the California-based flooring companies, Peninsula Floors, Inc., and JPS Surface Solutions, gathered to discuss flooring options. It wasn’t long before they were extolling the virtues of hard-surface tile. "I think for a certain group of buyers, tile is always their choice," said designer Mary McMurrin of JPS Surface Solutions in Newport, CA. "Especially in areas where they have hygienic concerns -- kitchens and baths -- they will always choose tile." There’s no denying the crisp, cool beauty of ceramic, porcelain, and stone. Or the cleanability and easy care these natural products afford. "I find that because homebuyers are so busy these days, they want a maintenance-free floor," commented Gaylene Higgins, who’s with JPS Surface Solutions in Corona, CA. 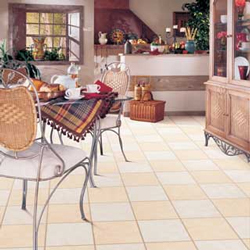 "Tile tends to require the least amount of maintenance of the flooring types." Tile is also no problem to repair. If one breaks, it’s an easy matter to pop it out and replace it. If water spills, even a lot of water -- no problem there, either. If a tile floor is installed and maintained properly, and the grout is a darker color, sealed to repel soil and stains, maintenance is a breeze. Ceramic and porcelain tiles provide some of the most versatile interior design possibilities, sporting an almost limitless array of sizes, colors, textures, and designs. Most of the materials used in making them are from the earth itself, while stone tile is actually quarried -- so each of these tiles tends to create an immediate natural ambience, a quality of timeless beauty, and a look that’s decidedly upscale. Like nearly every other category in home fashion -- furniture, fabric, decorative accessories -- flooring has lately felt the impact of the trend toward surfaces that are antique, distressed, and worn. Many ceramic and porcelain products have a vintage look that conveys a sense of history and almost ancient beauty. According to Robin Phelps, Design Center Operations Manager with Peninsula Floors in San Jose, size variations are also being seen these days. There’s everything out there from tiny tiles for mosaic applications to large, rather sheet-like squares of ceramic. "I would say that the larger tiles are very popular right now," said Phelps. "18X18 and 20X20 -- these seem to be the most significant trend." And yet another important direction has been noted in this popular flooring segment. "What we’re seeing is that more tiles are being made of porcelain," said designer Doreen Gaul, VP of Design Centers, JPS Surface Solutions in Westlake Village, CA. "It is a lot more durable. Consumers are getting wind of the fact and asking for it. Porcelain is also much more affordable than it used to be. Those qualities -- that it’s durable and affordable -- make it a good buy for a consumer." Gaul went on to expand the notion of what porcelain is and does, and its benefits: She described, for example, porcelain that looks like stone but doesn’t have to be sealed to avoid stain and odor absorption, so it’s especially easy to maintain. Another excellent buy for the consumer, said this designer, noted for taking superb care of her clients. The consumer who’s intrigued by a handsome array of flooring choices that includes the look of rustic stone, slate, travertine, or marble, or who’s elated by the idea of easy upkeep, has every reason to consider ceramic and porcelain tile with enthusiasm. And she’ll be in the company of some very fine designers.